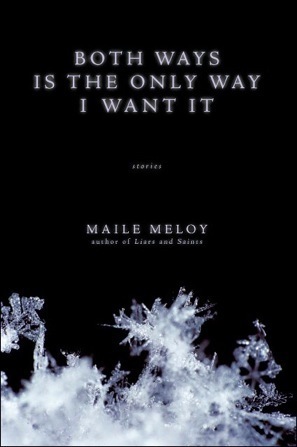 Maile Meloy pretty much blew me away with the first book of hers that I read, the 2009 short story collection Both Ways Is The Only Way I Want It. All 11 stories in that volume were very good or excellent, in my opinion — and that assessment was shared by the New York Times, Los Angeles Times and a number of prize juries. The book remains on my shortlist of favorite story collections. Meloy, born in 1972, has only published four works to date with two novels and this debut collection of stories comprising the remainder. While I promised myself I would spread out reading the rest of her work, I’m not doing a very good job of honoring that pledge — I read and liked the novel Liars and Saints last December, so with this one under my belt, I only have A Family Daughter to go. Half in Love was published in 2002, so Meloy wrote all of these stories before turning 30. I think it is a fair assessment to say that she was still experimenting with finding her voice in terms of both style and content. The 14 stories in this debut are all between 10 and 15 pages (a good length, frankly, for an author still finding her ground). While they are all on the positive side of neutral, the overall collection is not up to Both Ways Is The Only Way I Want It. That is an observation, not a criticism, but if you haven’t read Meloy yet I would recommend starting with her most recent work and then coming back to this one. The first time Hank slept with Kay — the only time — was the night her husband drowned. Her husband was his best friend, had been for years. Duncan was a great diver, a crack shot, a good storyteller. He seemed to like being in the world more than most people did. He’d married Kay on the grassy bank of a lake up in the Swan River Valley, and everyone danced barefoot and camped out for the weekend. The way Kay looked at Duncan, it was like he was the whole world. Everyone who saw them knew that. Hank and Duncan were in the underwater-welding business; the fatal accident came when they were looking for earthquake damage to the Hansen Dam in Los Angeles. They were 80 feet underwater when Duncan waved Hank to the surface. He took off his wet suit and packed his gear before realizing that Duncan had not surfaced. It truly was an accident, but that in no way lessens his guilt. Hank goes to fetch Kay after bringing Duncan’s body to the surface. They drove in silence back to the reservoir, and as they approached they could see Duncan’s body next to a police cruiser. One officer snapped pictures while the other sat sideways in the open car door, talking on the radio. Hank wished he had waited to call them, so Kay could have been with Duncan alone. She knelt by the body and pushed her husband’s hair from his forehead. Hank answered the cops’ questions, feeling awkward and angry. Yes, he had surfaced first alone. When he found Duncan there had been no pulse, and CPR had failed. He felt the cops’ contempt for him, for letting his partner die. Finally they took Duncan away. That quote supplies a representative sample of the economical way in which Meloy handles both detail and emotion. She has a seductive manner of engaging the reader in both and uses it to excellent effect. I’ll leave it to you to experience how Hank and Kay handle the disaster that is troublesome to both. There was no house yet, just a wellhead where the house would be, under an overturned box to keep the sand out. Clay was building the house, and it would be one to live in for a long time, so they were trying to get everything right. From the passenger seat, Susan watched him wedge the box between the green metal stakes that kept it in place. He climbed into the car and threw the water sample into the back seat. “Now,” he said, and he sat with his hand on the ignition. “The sandstone,” Susan said. She checked her watch, hoping they wouldn’t interrupt Albert’s dinner. A pile of cut sandstone from the pioneer days, chiseled by pioneer hands, spilled down a slope into the rice grass and knapweed. Susan scanned the pale red blocks, wondering, not for the first time, how much exactly there was, how much might be buried in the lawn and under the visible stone. The stone had once been a schoolhouse. On a pilgrimage to the library in Blanding, Susan had looked up an old sepia photograph of boys in caps and girls in aprons standing before a tidy one-room structure with a peaked roof, the blocks held together by mortar now long eroded. Susan wants the sandstone although she is more certain on why she wants it than how she will use it (“It’s beautiful stone. We want native stone to build with, railroad ties, things that fit in.”) Clay is more sensitive to how important the old stones are to Albert — and has a pretty high avoidance tendency which causes him to skirt making a sales request. What you have is three characters all attached in different ways to the stone blocks; the story explores the tension that that creates. I acknowledged my affection for horse racing fiction in my review of Jaimy Gordon’s Lord of Misrule, so let’s end this review with a brief look at Meloy’s “A Stakes Horse”. Addy and her elderly, ill father spend their summer weekends hauling broken-down horses to cheap throughbred racing meets held across Montana (I know from experience that these weekend meets are, indeed, very cheap — and often suspect in their commitment to fair outcomes). When the story opens it is the first weekend of the state fair in Great Falls, a meet that features the highest purses in the state. That result suggests some race-fixing in the jock’s room and later results suggest that is exactly what is up. Addy has her own, heart-breaking way of handling it. Don’t let my critical qualifications at the start of this review scare you away from this collection. Half in Love is a fine piece of work, even if Both Ways Is The Only Way I Want It is better. Perhaps the best news is that there is every reason to expect even better work in the future — Meloy is a talent who bears watching and reading.